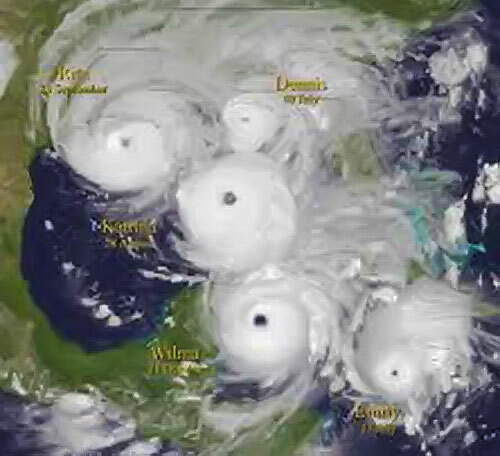 A hurricane is a violent storm originating over tropical waters with sustained (constant) winds over 74 mph. The winds, as in tropical depressions and tropical storms, blow in a counterclockwise direction around the center. Diameter of these storms can range anywhere from 100 to 1,000 miles. The real hazard which can occur with hurricanes include torrential rains, storm surge, tornadoes, and high winds. Each of these have the potential to cause severe injuries and fatalities. *** It should be noted that Category 5 storms are rare, but have occurred along the Gulf Coast. Advisory: Advisory messages are issued by the national Hurricane Center, giving information on all tropical depressions, tropical storms, and hurricanes. Tropical Storm Watch: A tropical storm is similar, but smaller than a hurricane. Winds associated with these storms are less than 74 mph, but can still cause widespread damage and flooding. Tropical storm watches are made for specific coastal areas where tropical storm conditions pose possible threats within 48 hours. Tropical Storm Warning: This warning means that tropical storm conditions, including possible sustained winds of 39-73 mph are expected in specific coastal areas within 36 hours. Hurricane Watch: These watches are made for specific coastal areas. These are NOT warnings. These watches mean that a hurricane is close enough for everyone to listen to advisories and be prepared to take precautionary measures. Watches are usually issued 48 hours prior to landfall. Hurricane Warning: This warning means that a hurricane is close enough to a specific coastal area that precautionary measures must be taken immediately. These warnings are usually issued 36 hours prior to landfall. However, if the hurricane's path is unusual, it may only be a few hours before landfall before the warning is issued. Option A: Stay Home: However, before you choose this option, make sure you know your elevation. If we experience a storm that may put a significant storm surge in your home, you need to look at the other options. Also, people in manufactured and mobile homes cannot use this option. Mobile homes and manufactured homes are not built to withstand the high winds associated with tropical storms and hurricanes. Option B: Stay with a friend or relative who has a safe place: If this is your plan, make arrangements in advance. You need to make sure that where you are going is safe. It defeats the purpose of evacuating if you go to an unsafe place. Option C: Relocate out of the area: You may wish to travel out of harms way. Be sure to bring a road map and make sure that your car is full of fuel. Stay away from major bodies of water. Make arrangements in advance if you can. If you decide to use this option, go early, traffic will be heavy if you leave at the last minute, and you may not make it to your destination. Using public shelters is another option. However, due to the location of many shelters, they may not be able to be opened. You should not plan on using a shelter if at all possible. It should only be a last resort. Keep in mind that pets are not allowed in shelters. Whatever option you decide to exercise, make sure you bring at lest 72 hours worth (a week's worth is preferable) of food, water, clothing, medicines, and other necessities that you might need. If you decide to bring your pet, you must prepare a plan for your pet as well.